This hand shaped tree of love craft idea was inspired by a tree craft I saw over at Ramblings of a Crazy Woman – totally different so be sure to check it out (scroll down past all the cute, heart-shaped animals to see the heart tree). 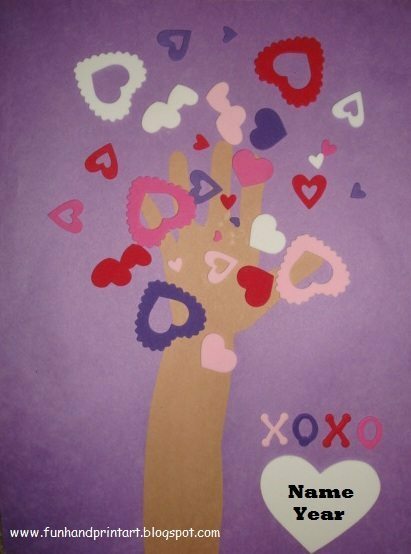 To make the handprint ‘Tree of Love’ craft, I traced around my son’s arm and hand on brown construction paper, cut it out, and then glued it to purple construction paper. I then gave him foam sticker hearts to place on as the tree’s leaves. I placed XOXO on the bottom with one of the big, white foam hearts and wrote his name and the year on it. Makes a cute Valentine’s Day art project! Thanks for linking me up. GREAT tree!!! Love it. This is awesome! I am loving your february stuff! Thanks! I have so much more to post on both blogs and am unable to because of computer issues this past month and are way busier than usual….hopefully I can get the homemade clay one and mailbox one up soon! love this tree actually made one today with little man! thanks for the great ideas! This is sooo cute! Will do this with M and link back to you!